This month’s song over at Dueling Mixes is a pretty epic tune. There’s screaming and orchestras. Heavy guitars and a choir part. 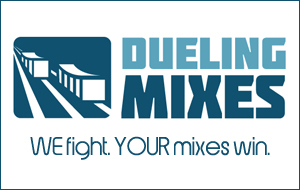 If you’re a member (and you can become one in about 60 seconds over at www.DuelingMixes.com), you’ll notice that there’s a LOT going on in the mix. Your instinct will be to figure out a way to effectively use all the tracks in the session, to make them fit well together and form a huge, cohesive mix. Nothing wrong with that, but there’s something you might forget. You mix the song. The song doesn’t mix you. In other words, don’t let the song boss you around. For example, in my mix of this month’s song, I cut out an ENTIRE section of the orchestra. I’m sure the artist worked hard to write/record the string parts, but they just weren’t working with the rest of the instruments. Cutting that section made the mix sound better. I maintained control of the mix, not the other way around. It’s a tough lesson to learn (and I constantly have to remind myself this), but the mute button can be one of the best tools you’ll ever use in the studio.